THE EARLY return to pre-season training of premiership stars Liam Picken and Tom Liberatore has the Western Bulldogs' crop of exciting young talent inspired, key defender Aaron Naughton says. The crucial playmaking pair has been notable on the track this week, returning with the first-to-fourth-year players despite not being required on duty until November 19. Picken failed to play a senior game this season after suffering a heavy concussion in the JLT Community Series in March, while Liberatore ruptured his ACL for the second time in round one of the season proper. Speaking after training on Friday, Naughton said he and his fellow youngsters were buoyed by having such respected teammates on the track so early into their 2019 preparations. "Picko and Libba are good characters and bring a lot of energy to the group, so it's really good to have some leadership around us young boys," Naughton told AFL.com.au. "They seem like quiet blokes, but in the inner sanctum they're quite vocal. "They both pretty much missed the whole of last season, so to have them back for week one of training is very exciting for us. "They're both really good players and been around the club for so long. Hopefully I get the opportunity to play alongside them more often, because they bring so much to the team." 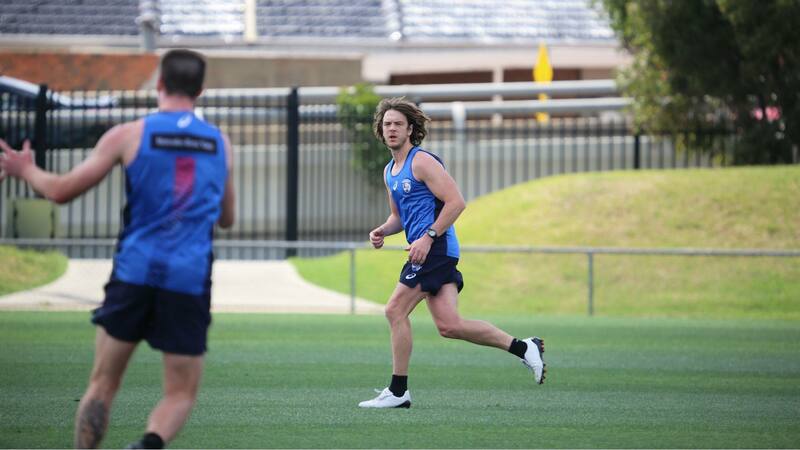 Picken, who did some training throughout the year during his recovery from his head knock, looked sharp on the track, while Liberatore showed no signs of his injury as he completed a series of ball- and goal-kicking drills. Fifth-year players Toby McLean, Zaine Cordy, Caleb Daniel and Roarke Smith were not required back at the club until later in the month, but have also been training strongly. With the Dogs struggling to hit targets and the scoreboard since they won the premiership in 2016, Naughton said senior coach Luke Beveridge had once again emphasised to his players that sharpening up their skills would be a major focus this off-season. Under the watchful eye of development manager Rohan Smith, the young pups were put through a range of drills on Friday focused on hitting targets via foot. Towards the end of the 90-minute session, the attention switched to goal kicking, with players honing their skills with running, set and banana shots on goal. "Bevo is always encouraging us to improve our skills, so the balls were out on day one of training, and I think that lifts the spirits of the boys, because there's nothing better than having a footy in your hands," Naughton said.